The arrival of a new baby is an exciting time for any parent. But when a complication arises, those excited jitters can quickly change to worry and even distress. James Koser found himself in this tense situation after a sonogram revealed irregularities in his wife’s pregnancy. Doctors at the University of Maryland Medical Center discovered that James’ wife, Basia, had vanishing twin syndrome a condition where one baby does not fully develop and is absorbed by the other. However, in Basia’s case, the placenta of the vanished twin attached itself to her cervix causing a heterotopic pregnancy. This diagnosis poses a health risk to the mother and developing baby. Anticipating a challenging and early birth, the Kosers sought out the expert physicians at the Drs. Rouben and Violet Jiji Neonatal Intensive Care Unit (NICU) at the University of Maryland Children’s Hospital. Opened last fall, the Level-IV NICU provides the most critically ill infants with a private and comfortable space for comprehensive treatment. It also offers parents support and comfort during one of the most challenging and difficult times of their lives. Made up of 52 individual rooms, the NICU provides families with a private and relaxed space to stay with their infant. Day and night, James and his family could bond with Andrew while he received medical care from a team of highly skilled doctors and nurses. The team never rushed through explaining a medical concern or procedure, James says, and showed compassion while caring for his son. 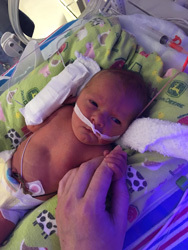 During his time in the NICU, Andrew’s health improved. He gained weight and further developed his voluntary muscles. 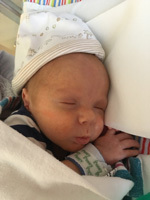 Before being discharged, Andrew needed to reach a series of milestones, including passing a car seat test to confirm that he could breathe properly and be safely transported home. “They literally thought of everything to ensure that when the baby comes home, he has no setbacks,” James adds. Andrew is now thriving at home with his parents and two older brothers, ages 3 and 5. His mother has also since recovered from the complication she experienced during her pregnancy. 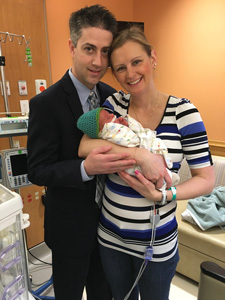 Even though the Kosers were already parents to two healthy boys, Andrew’s birth was an entirely different and unfamiliar experience. For the Koser family, their efforts paid off. And now, their future as a family of five is just as bright as they imagined. The Drs. Rouben and Violet Jiji Neonatal Intensive Care Unit is funded in part by philanthropy. Continued innovation in research and patient care are key factors in sustaining its level of excellence.